Historical building dating back to 1715. 1 Park Row is situated right in the heart of the historic market town of Farnham in Surrey; the building, set on three floors, was once the site of The Garibaldi Inn which served ales right up until 1910. Now, 1 Park Row has been lovingly restored into a Bed & Breakfast offering 3 rooms 2 with en-suite shower or bath rooms, one with a private shower room. All rooms have TV, DVD, CD, tea making facilities and wireless Internet. We offer a self service Continental Breakfast and encourage our guests to enjoy the many Pubs, Wine Bars and Restaurants in Farnham, the first of which is only 1 minute away. 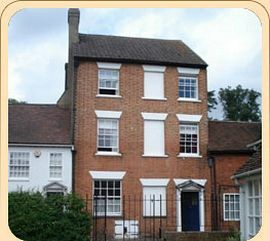 The house is within a mile of the mainline station at Farnham, from which Waterloo can be reached in 50 minutes. There is good access to the M3 and A3 and Heathrow and Gatwick can be reached within an hour and a half. Rooms are from: £45.00 to £75.00 per night. Check in is from 2pm; check out is before 10.30am. Special Diets Provision: Special diets are catered for. Please contact us when you book. Head to the centre of town and park in Castle Street. There is a little road next to The Nelson Arms pub which is Park Row. The railway station is only 500 yards from the centre of town where Park Row is situated.